In the year 1535, Henry VIII assumed the title 'Supreme Head on Earth of the Church of England', finally breaking with Rome. 1541 was the memorable year in which Henry, by letters patent, ordained the Chapel of Saynte Mariden the Parish Church of the parochial district of ten townships assigned to it, receiving the name Deane after the ancient village. Henry the Eighth by the Grace of God King of England and France, Defender of the Faith, Lord of Ireland, and on earth the Supreme Head of the English Church, to all to whom these presents shall come. Greetings! Since the parochial chapel of Deane in the diocese of Westchester, which was lately impropriated to the monastery of Whalley and is now in the right of our crown, stands eight miles, or thereabouts, distant from all other churches or chapels, and has an ample parish and parishioners, a chancel, vestry, choir, nave, altars, font, bellfry, bells, cemetery, altar-dues, and other insignia of a parish church, together with vestments, chalices, crosses, banners, thuribles and all other trappings necessary for divine service and equipped for the administration of a parish church in all things. And since there is also at the said chapel of Deane always a curate to celebrate mass and all other divine offices for the parishioners, and to administer the sacraments and sacramentals to the said parishioners; so that the parishioners are less bound to attend another altar, church or chapel to hear divine service or to take part in the sacraments and sacramentals, as has heretofore been beneficially decreed from time immemorial. Know therefore that we, extending our benevolence (to the greater glory of God and divine worship, as also to the accommodation of the said parishioners) from our special grace, as well as from the certain knowledge and genuine reasons moving us, wish, grant and ordain that the said chapel of Deane henceforward is and shall be appointed a parish church wholly free and distinct from all other churches or chapels, and shall have a parish and parishioners assigned to it henceforth from its old limits and boundaries, separate from all other parishes and parishioners whatsoever. And there shall also be in the same church of Deane a permanent vicar presented by us and our heirs, and instituted by whoever is the ordinary for that part for the time being. Which vicar shall have the cure of souls there, and shall celebrate mass and other divine offices, and administer the sacraments and sacramentals there, taking upon himself and performing the duties incumbent upon the vicar of the said church, and doing all things according to the laws and customs of the church of England. Always providing that the vicar of the said church of Deane for the time being shall not receive by way of stipend any more from us or our heirs than the curate there has been accustomed to receive. In which affair there exists no express mention of the true annual value, nor of the certainty of matters here mentioned; neither is there any act or statute to the contrary made by us or our ancestors, or to be made in the future, nor any other thing, matter or cause whatsoever standing in the way. The Great seal of England is affixed by silk cords of green and white, the Tudor colours. 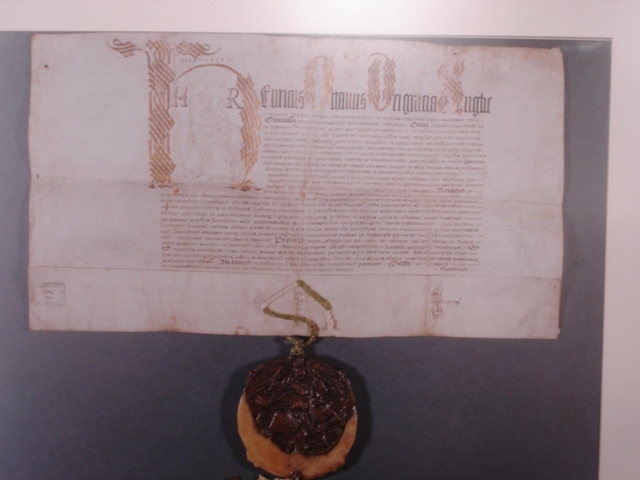 The original letter patent (of which the above is a photograph) is stored in the Lancashire County Record Office at Preston.